How Much Does it Cost to Climb Mount Everest? – 2019 Edition 2018/19 Winter Climbs: K2 Climbers Enroute, Antarctic Update, 28 Everest Summits? The K2 teams are on their way to Pakistan for their winter attempts but not without problems already. Despite comprehensive efforts, the guys could not find money for all originally claimed eleven members. Therefore, the team will go to Karakorum in a reduced composition. There will be seven of them..
Vassiliy Pivtsov is still the expedition leader and Basil Pivtsov (Kazakhstan) is the head of the expedition and the team captain. Artem Brown (Russia) is listed as the project organizer. It’s reported they climbed together above 7,000-meters for the “Winter Snow leopard” program, and the team leader Vassily Pivtsov has climbed all 14 highest peaks of the world without the use of supplemental oxygen. They plan to arrive in Islamabad no later than January 1, 2019 and climb the traditional Abruzzi route. The second team is lead by Alex Txikon who has already arrived in Kathmandu according recent social media posts. There he is meeting with his Sherpa support team. He will be climbing with his long time friend and partner Felix Criado from Galicia, Spain and now two additional teammates: Polish climbers Marek Klonowski and Paweł Dunaj. They will have a strong team of eight Sherpas with them in support including Nuri Sherpa, Chhepal Sherpa, Geljen Sherpa, Hallung Sherpa and Pasang Sherpa. He has not announced what route they will use, Abruzzi or Česen or even the East Face. 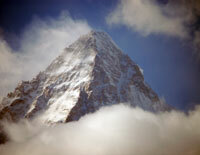 The pair attempted K2 in 2013 but stopped just above Camp 2 at 6,900-meters. In a vague series of reports, Daniele Nardi with unnamed partners will attempt a new route on Nanga Parbat. We know have more clarity saying that Italian climber Daniele Nardi and British Thomas Ballard with their two Pakistani team members Rehmatullah Baig and Karim Hayat according to Pakistan Mountain News. This will be his fifth attempt on NB. Alex Txikon, Simone Moro and Ali Sadpara made the first winter summit on February 26, 2016. A 2 members team supported by 2 Pakistani high altitude climbers led by Daniele Nordi is in Islamabad to make another Winter attempt on Nanga Parbat. “a lot of people ask me about Nanga Parbat in winter, I am not going exactly for Nanga Parbat but to complete new route in winter along Mummery Spur in alpine style, so our first objective is to complete this route up to 7000 meters and after this climb to reach the top. In the past I tried to complete this route but I couldn’t finish it, so this is the real enthusiasm to go there”. The American Alpine Club has said they will award Dennis Urubko, Adam Bielecki, Jaroslaw Botor and Piotrek Tomala the David A. Sowles Award, which recognizes “unselfish devotion at personal risk or sacrifice of a major objective, in going to the assistance of fellow climbers imperiled in the mountains.” The ceremony will be at their annual benefit dinner on March 9 in San Francisco, California. In January 2018, the four climbers left their winter K2 attempt to save Elizabeth Revol on Nanga Parba. She was climbing with Tomek Mackiewicz, who died during the descent. Simone Moro and Pemba Gyalje Sherpa will be attempting Manaslu via the normal route in alpine style after acclimatizing on Mera Peak. American climber Lonnie Dupre, well known for his amazing attempts to summti Denali in true winter is back at it again with a winter attempt on nearby Mt. Hunter. With great fanfare, American Colin O’Brady, finished his 54-day Antarctic traverse, solo, unassisted, and unsupported journey to the adulation of the adventure world. It was an amazing accomplishment for this 33 year-old who pulled a 136Kg/300lb sledge from one coast to Antartica to the South Pole then to another costal point. The total journey was 1,487km/923 miles. He beat fellow racer, British Army Captain Lou Rudd by 2 days. This was an amazing achievement worthy of all the press both adventurers are receiving but now there is a hitch. Explorersweb is suggesting he was assisted given he traveled on the McMurdo-South Pole Highway, or the South Pole Overland Traverse Road (SPOT), a flattened trail groomed by tractors towing heavy sledges carrying personnel and supplies from McMurdo Station to the South Pole. Obviously traveling on groomed ice vs the uneven and often impossible sastrugi (wind built ice formations) makes the entire journey much easier, and faster. Furthermore, both shortened their route significantly by calling a halt at the beginning of the Ross Ice Shelf: which their famous predecessors from the Golden Age of Antarctic Exploration — and some strong modern travelers — did not. Borge Ousland’s 1996-7 crossing of Antarctica is often called “assisted” because he used a kite part of the way. However, his route covered the entire Ross Ice Shelf and was 1,000km longer than theirs. O’Brady’s and Rudd’s route vs Ousland’s. Some polar veterans doubt whether the truncated route qualifies as a full traverse. Himalayan Trust announces The Elizabeth Hawley Memorial Master’s in Journalism Scholarship 2019-20. Miss Hawley who was born in Chicago in 1923 first came to Nepal in 1959 and just never left. She first served as a journalist for Reuters, reporting on her first Mount Everest expedition in 1963. Elizabeth went on to run Sir Edmund Hillary’s Himalayan Trust, was the New Zealand Honorary Consul to Nepal, and the keeper of the Himalayan Database. It was her role in the Himalayan Trust that bought Elizabeth into American Himalayan Foundation’s (AHF) world and for over three decades she worked closely with AHF as a trusted partner, and dear friend. Country Representative of Himalayan Trust, Miss Hawley passed away on January 26, 2018 at the age of 94. In her honor, AHF has started the Elizabeth Hawley Memorial Master’s in Journalism Scholarships (HJS) commencing in March 2019. The scholarship will be open to all Nepali women with a bachelor’s degree and an existing body of journalistic work in Nepali and/or English. The scholarship will be competitive, with only one offer each year for a two-year course and will cover the university cost of the master’s degree program and the purchase of a laptop. • Applicant must be a Nepali citizen, resident in Nepal. • Applicants must satisfy the admission criteria of the Tribhuvan University for a Master’s degree in Journalism and Mass Communication. These include having a bachelor’s degree in the same subject. • A one-page statement convincing the committee why the applicant should be selected. • Further commitment to work as a journalist must be demonstrated. An application letter with a statement of conviction and photograph, copies of published English articles, news or blogs, current CV with academic transcripts and supporting documents must be received by Himalayan Trust by email to info@himalayantrust.org.np or mailed to Post Box No. 224, Kathmandu, Nepal before January 15th, 2019. Only short-listed candidates with full documentation will be invited for an interview. The committee’s decision will be final. A perfect winter day on Colorado’s 14er Quandary Peak today. The sky was a perfect blue, the mountain side was covered with a perfect blanket of snow, only broken by an artistic rabbit seemingly focused on creating the next Bunnybrandt. The fresh snow seemed content to stay where it landed, a pine tree limb, a tree trunk, the top of a rock. But when the wind blew, all fell in line as if to acknowledge who was the true ruler of the mountains. And I must bow my head to this one! With the temperatures hovering around 0F, any exposed skin instantly complained. But nature has a way of putting us humans in our place. On the way down, I was greeted by the Quandary goats. They were warm in their deep, rich fur coats. The moms looked at me carefully as the kids literally jumped like kids in the snow. They made me smile. As I walked through the woods, past tree line towards the summit, and then back down, the stillness of this cold winter day brought me a deep sense of contentment and peace. Mom and her crazy kid!